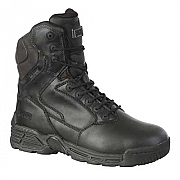 Magnum boots are lightweight, strong and durable, while offering great ankle support. Magnum boots are a popular choice for serving police and military worldwide. Magnum's New Elite Force 8.0 WPi features their ion-mask technology, which was originally developed to keep chemical agents off soldiers. Magnum is now bringing this technology to the law enforcement market with the introduction of the Magnum Elite Force 8.0 WPi boot. 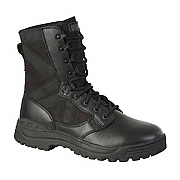 Magnum Scorpion Black Boots, lightweight combat boots for police and military operations. The Magnum Scorpion Black Boots are new to the Magnum boot range, are ultra lightweight and NATO Approved combat boots. A lightweight patrol boot, the Magnum Scorpion Black Boots are manufactured from a high quality leather and 1150 Denier Nylon upper with a Magnum Breathe Right lining to maximise breathability and comfort. 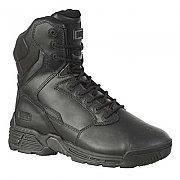 Magnum Stealth Force 8.0 Leather Boots CT/CP S3 for military, police or SWAT and MoE operations. 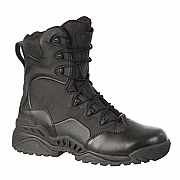 Magnum Elite Spider 8.1 Urban Boots, lightweight combat boots for military and police operations. Magnum Elite Spider 8.1 Urban Boots are tested & certified to European standard en 20347: 2004 for occupational footwear.